I’m still catching my breath after a two-week (and too long) trip to Italy, including a day I spent in the vineyards in Franciacorta talking to growers about soil types. The weather already feels like early summer there and there are already grape bunches forming in the vineyards, like this Chardonnay bunch above. I snapped this photo in the eastern part of the appellation, where a cool breeze arrives from the Alps to the north. Until veraison — the onset of ripening — occurs, it’s nearly impossible to predict when harvest will be. 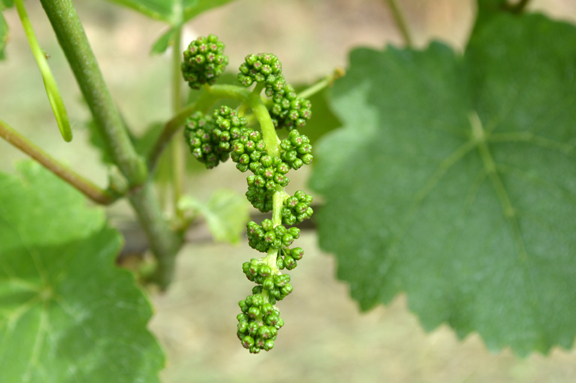 But if the weather patterns continue, many are already predicting an early (earlyish) harvest for Franciacorta, which generally begins picking at the end of August. Franciacorta is a unique appellation among Italian wines inasmuch as it is arguably the best equipped to deal with warmer and earlier vintages (like 2015 might be, although it’s still way too early to tell). Whereas sparkling wine appellations to the north of the Alps do better in warm vintages (because they achieve greater phenolic ripeness that way), Franciacorta producers — with their Alpine climate — prefer cooler vintages that allow the grapes to ripen more slowly. But even in warmer vintages, the superb ventilation of Franciacorta, which is aerated by air currents arriving from the Alps as well as from Lake Iseo, it’s rare that Franciacorta growers are forced to pick too early. I’ll be heading back to Franciacorta for an extended stay during the harvest. And I’ll be posting regularly on the growing cycle as more news and clues emerge from the appellation.